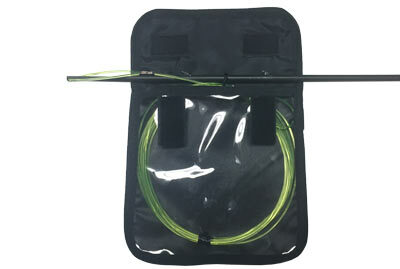 The MAKO Spearguns Shooting Line Keeper functions like a wallet for your mono it's what the pro's use to keep their shooting line from becoming tangled. Also protects your shooting line from nicks and abrasions so you don’t lose that big one. 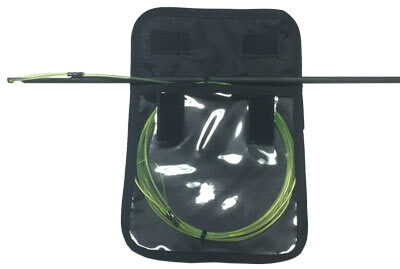 Attaches to any spear with Velcro closures. 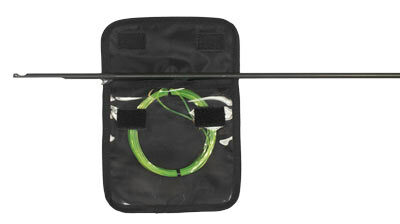 Our 300lb and 400lb Mono Shooting Line with Crimp Pack includes 50 feet of mono and 12 double barrel copper crimp sleeves. Note: Our High Vis mono is made by Momoi from Japan and our red, black and blue mono are made by Lindgren Pitman. The Speargun Shooting Line Keeper can be used easily on notched spears, spears with mini sharkfin tabs, spears with high profile sharkfin tabs, in fact the Shooting Line Keeper works with every spear we've tested. These things are cool and at 1/2 the price or better than the few others I've seen. Exactly what it say. Keeps lines neat when traveling.